The place that I bought my OPI My Private Jet, also had bottles of Color Club so not only did I want to get a bottle of Revvvolution, but I wanted to get 2 bottles. So you imagine my surprise when I saw this. 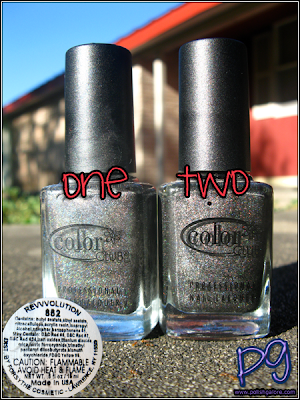 Revvvolution is a black holo which just makes my day - it's everything I love in a polish. I used a base of Seche Natural, 2 coats of Revvvolution and no top coat. Here in the sun, I really think that my Two is darker than my One, just like the bottles. Holos hate shade. But you can see in the shade that there are different base colors of black here - One is more gray. Well, either way I still love this polish. You know, mine is quite gray which was a huge disappointment to me. I wanted it to be that gorgeous black. I think Color Club doesn't realize there's def. 2. Wow! That's serious difference, great post! I see the difference! I don't know which one I like better. I have to go home and see what mine is! I can't decide which one I like better....both are pretty fabulous!